These pages are my attempt to give something back to the synthesiser DIY community. The projects listed on these pages would not have been possible without the help of many knowledgable people who share their projects and expertise on their websites and on the synth-diy mailing list. So thank you all! Simple multi-voltage bench power supply. Precision MIDI to CV converter with 3 Gates, 15 CVs, Portamento, Envelopes, LFOs, and other interesting and useful software features. Small collection of Digisound 80 modules and some modifications. A collection of Roland CR78, TR808 & TR909 based drum modules with MIDI In and velocity sensitivity. A weird and wacky noise generator with MIDI In, ADSR, VCA and 'touch pad'. Oakley Sound 3031 synth with my own design MIDI to CV converter. 6-dimensional dual joystick controller with MIDI and CV outs. Modular Compressor / Limiter / Distortion / Gate unit. Quad digital delay/flanger with multiple LFOs and comprehensive analog I/O. 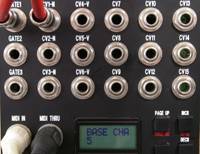 Multi-purpose digital module with plenty of analog interface options. Boss DC-2 Dimension C chorus clone. All the designs, schematics, PCB layouts and source code on this website are my own unless otherwise stated. I grant permission for use of everything of mine for personal (non-profit) projects as long as credit is given (and if you publish something on the internet that uses my work then please link back to this website). If you wish to use something commercially then please contact me first ( ). Where it is stated that something is taken or derived from someone else's work, please also check their website for conditions of use.